Submit a Quote to us! A Greek historian known for his own work "Bibliotheca historica". St. Jerome in one of his writings tells us: "Diodorus of Sicily, a writer of Greek history, became illustrious." Bishop of Hieropolis and apologist in Phrygia, composed his own epitaph, conveying a vivid impression of his visit to Rome, and giving valuable information about the importance of the Church of Rome in the 2nd century. Author of the book called "The Shepherd" (A.D. c.90-c.150): a work which had great authority in ancient times, considered a valuable book by many Christians. at Rome in the year A.D 107. Roman; Pope from A.D. 88-97; martyr. That St. Clement was honored by the friendship of the great Apostle, St. Peter, is not doubted. There are good reasons to believe that he was designated by that Apostle as his successor in the see of Rome. The authenticity and genuineness of St. Clement's First Epistle to the Corinthians are acknowledged. We learn from Eusebius and from other writers, that it was publicly read in many churches. This second epistle is the oldest extant Christian homily we have attributed to him, (A.D. 150). From Asia Minor; bishop, defender of orthodoxy, martyr; appointed Bishop of Smyrna by the Apostle St. John. 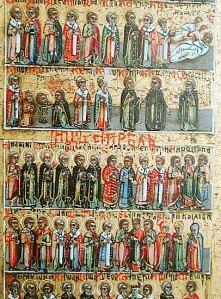 Bishop of Hierapolis, writer, called by St. IrenÃ¦us "a hearer of John, and companion of Polycarp, a man of old time." (Eusebius H. E. i. 36), he composed five books on the "Discourses of our Lord"; but a few fragments of which remain; they were preserved by Eusebius. Samaritan; born in Sichem (Naplousia) in Palestine; a platonic philosopher, apologist, and martyr for the faith; he was a convert to Catholic Christianity in A.D. 133. He wrote two Apologies for the Christian religion, one addressed to Antoninus, the other to Marcus Aurelius. He was martyred at Rome in the year 163. Greek; bishop of Corinth, famed for his letters. He is described in Eusebius' Ecclesiastical History. One of Dionysius' letters commemorated the martyrdom of Sts. Peter and Paul. Greek; second century Greek Christian author who is primarily known as the author of the Apology of Aristides. Bishop of Sardis near Smyrna in western Anatolia, was an exegete and apologist and a great authority in Early Christianity. A Jewish convert to Christianity and chronicler, he journeyed to Rome around the year A.D. 157, Of his works nothing remains but a fragment, or two, preserved by Eusebius. An early Christian writer and theologian. A disciple of St. Justin. Tatian's most influential work is the Diatessaron, a Biblical paraphrase, or "harmony", of the four gospels that became the standard text of the four gospels in the Syriac-speaking churches until the 5th century. Patriarch of Antioch, born pagan but embraced Christianity by studying the Holy Scriptures, especially the prophetical books. Wrote against idols, made contributions to Christian literature, polemics, exegetics, and apologetics. Asia Minor; bishop, missionary, theologian, defender of orthodoxy. Though by birth a Greek, he was Bishop of Lyons in the second century. He tells us that, in his early youth, he learned the rudiments of religion from St. Polycarp, the disciple of St. John the Apostle. He wrote several works, of which only a few fragments are now known, with the exception of his Treatise against Heretics which we have in five books. African; he was one of the earliest of the Latin apologists for Christianity. He wrote an apology for the Christian religion, in the form of a dialogue between Caecilius Natalis, a heathen objector, and Octavius Januarius, a Christian respondent, whilst Minucius acts the part of a moderator. Are venerated as Christian saints. Close friends since childhood. Their feast day is 22 April. Epipodius was a native of Lyon; Alexander was said to be a native of Phrygia, and a physician by profession. They were both martyred during the reign of Marcus Aurelius. Athenian; a Proto-orthodox Christian apologist, a philosopher, and a convert to Christianity. According to Philippus Sideta, he presided over the school at Alexandria. He flourished about the year 170. He wrote apologetic defenses of the Christian religion, and a treatise on the Resurreotion. Greek; theologian, a scholar of Pantaenus, to whom he succeeded as head of the Catechetical School at Alexandria, Egypt. His writings display great acquaintance with the Gentile philosophy. He wrote with the express design of hiding the mysteries of the Christian religion from the Pagans, and the uninitiated, while at the same time, laboring to show the immense practical superiority of the Christian code of morals over that of every Pagan sect and system of philosophy. North African; Ecclesiastical writer, Christian apologist and lawyer, son of a centurion and contemporary of St. Irenæus, a native and citizen of Carthage. The zeal and ability with which he defended the Christian cause, and vindicated its faith and discipline, have immortalized his name, though it has suffered by his adoption, around the year A.D. 200, of some of the Montanist's errors, whose cause he is thought to have supported until his death. His works are numerous, and are written with great ability and erudition, but in an harsh style. Roman; bishop and martyr, probably a scholar of St. Irenæus of Lyons. An eclectic Platonist and polemical writer against Christianity, who flourished towards the end of the second century. Alexandrian; born in Egypt, philosopher, theologian, writer. Eighth bishop of Antioch, (A.D. 190-211), known principally through his theological writings.